An overview of the procedures and techniques available to our Cardiology patients. Patent ductus arteriosus, commonly called PDA, is one of the most common congenital heart defects in dogs. A PDA is a small vessel that connects the two main vessels exiting the heart (the aorta and the pulmonary artery) in the developing puppy up to the time of birth. Sometimes this vessel persists into adult life and must be occluded as soon as possible before the heart suffers irreparable damage. Minimally invasive occlusion of a PDA is possible by advancing catheters into this structure and releasing a special device inside which stops the flow of blood. Different devices may be used for this purpose. The most commonly used nowadays is called the Amplatz Canine Duct Occluder (ACDO). This device is very versatile and results are extremely good. It may used in dogs as small as 2.5 – 3kg. In smaller patients other devices (coils) may be used. If the patient dimensions or anatomy of the defect do not allow the use of minimally invasive procedures, open-chest surgery is warranted. The skill and experience of our surgeons have yielded excellent results in all of the cases we have treated. 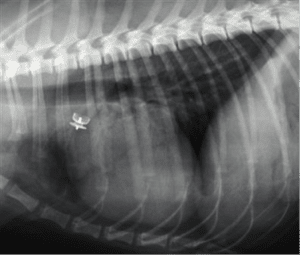 Chest radiograph of a dog with an ACDO device implanted in the PDA. This procedure is used to treat a congenital heart defect – Pulmonic Stenosis – in which the pulmonic valves have not developed appropriately (are fused) and are unable to open completely, leading to obstruction to blood flow exiting the heart towards the lungs. 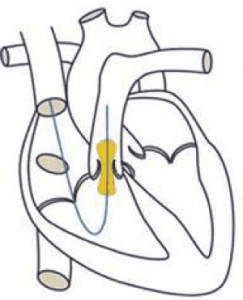 Diagram of the heart illustrating the catheter with the inflated balloon at the level of the pulmonic valve. A catheter with a balloon on the tip is introduced through a vein on the neck or the leg and is advanced up to the heart. 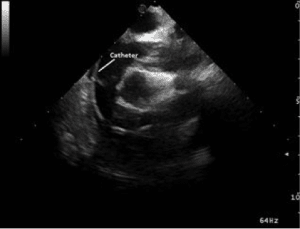 Once the tip of the catheter is positioned at the level of the pulmonic valve, the balloon is inflated rupturing the fused valve cusps in an attempt to reduce the obstruction. 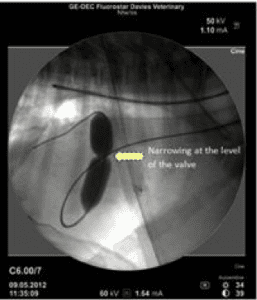 Fluoroscopic image with the balloon being inflated in a recent case. This procedure is used to treat a congenital heart defect – Subaortic Stenosis – in which a ridge of tissue is present beneath the aortic valves causing obstruction to blood flow exiting the heart towards the whole body. Initially a catheter with a balloon on the tip that contains metal blades on its surface is introduced through an artery on the neck or leg and is advanced up to the heart. 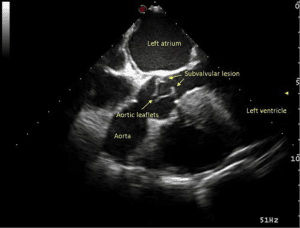 Transoesophageal heart scan depicting the subvalvular ridge of tissue in a dog. Once the tip of the catheter is positioned at the level of the subaortic lesion, the balloon is inflated and the metal blades cause cuts on the ridge of tissue responsible for the obstruction. Subsequently another balloon catheter (high pressure balloon) is introduced and inflated at the same level causing rupture of the tissue along those cuts effectively reducing the degree of obstruction. 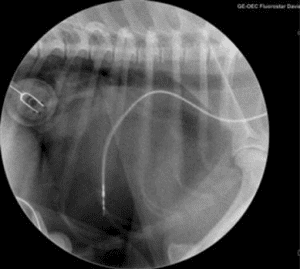 Fluoroscopic image showing the cutting balloon being inflated in a dog. Biopsies are samples taken from abnormal tissue (e.g. cancer) anywhere in the body. These samples are sent to a pathologist in the lab for analysis so that a diagnosis can be achieved and treatment may be chosen. This can also be done in the heart. Catheters and biopsy forceps are introduced inside the heart to take samples of the heart muscle or masses inside the heart. This is performed by our Cardiology team under general anaesthesic and with full anaesthesia support. Transoesophageal echocardiography (heart scan) and fluoroscopy (real-time x-rays) are used to monitor the procedure. Heartworm is a parasite (Dirofilaria immitis) that lives inside the pulmonary arteries and, in cases of severe infestation, the heart itself . 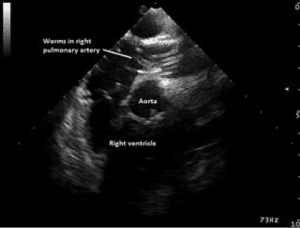 The presence of adult worms inside the pulmonary vessels causes physical obstruction to blood flow and leads to inflammatory changes of the vessel wall that may result in severe lung compromise, heart failure, other organ damage (e.g. renal) and even death. Luckily this disease does not exist in the UK. However, with an increase in the number of dogs rescued from other European countries, infected dogs may be encountered in the UK. Medical treatment involves risks and physical removal may be preferable in severely affected patients. 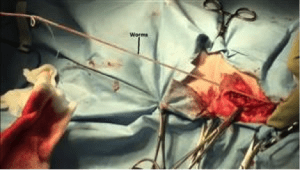 This can be performed by introducing catheters and forceps via peripheral vessels into the heart and up to the pulmonary vessels to retrieve the worms. Our cardiologists have experience with these procedures as they have worked in affected countries previously. The retrieval catheter can be seen. Worms being removed from the same dog. As occurs with humans, some dogs or cats need a pacemaker to stay alive. In the past, our ICU team, made up of anaesthetists, cardiologists and surgeons would implant a temporary pacemaker to save a patient’s life. This would involve introducing an electrode through one of the veins in the leg and advancing it up to the right side of the heart. A machine would then stimulate the heart to beat at a normal rate until a permanent pacemaker could be implanted. Nowadays, with our larger team of cardiologists, the majority of our patients have a permanent pacemaker implanted shortly after admission, even during the night or weekends. Temporary external pacing, using electrode pads attached to the chest, is used to keep the patient alive during anaesthesia – making it a very safe procedure. 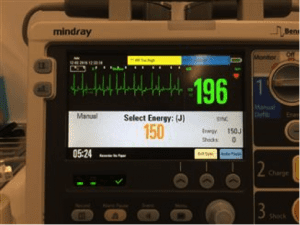 Electrical cardioversion is used for treatment of some cardiac arrhythmias such as atrial fibrillation, atrial or ventricular flutter and others. It consists of applying an electrical shock to the heart through the chest. The flow of electricity through the heart muscle resets the cardiac cells allowing a return to normal electrical activity. This procedure is done under general anaesthesia. It is a very safe procedure performed with full anaesthesia support from our anaesthesia team in cooperation with our cardiologists. Most of our patients are discharged on the same day. We are one of a very few specialist centres in the whole world that are able to offer these procedures for dogs. 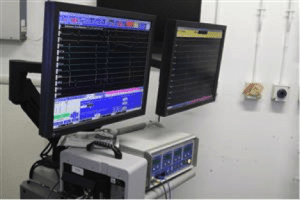 An Electrophysiology study (EP) is a minimally invasive procedure in which catheters are positioned at specific sites in the heart to record intracardiac electrocardiograms (electrical activity of the heart muscle). Analysis of these electrocardiograms allows the identification of the mechanism of cardiac arrhythmias and the location of the abnormal area(s) in the heart from which they arise. 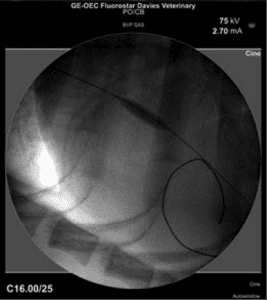 The abnormal area is then destroyed by applying localized heat via radiocatheter ablation. A special catheter (ablation catheter) is used for this. These procedures allow a definitive diagnosis and cure in the majority of patients without the need for further anti-arrhythmic medication. Which arrhythmias can be treated in this way?